Here's how the home improvement leader is directing billions of dollars toward long-term growth initiatives. Home Depot (NYSE:HD) is downright frugal when it comes to store-expansion plans. The home improvement giant expects to open no new warehouses in 2016, even as smaller rival Lowe's (NYSE:LOW) adds 45 shops to its base. While happy with its retailing square footage in the U.S. right now, Home Depot is plowing money into other growth initiatives. In fact, the company plans to spend significantly more cash this year on a few key priorities that management sees as well-deserving of increased investment dollars. Executives know that a national retailer can't thrive without a robust e-commerce business, and that's why they're dedicating major resources to achieving that goal. Shipping distribution centers, including a high-tech 16 million-square-foot facility that opened last September, now mean that the company can reach 90% of U.S. customers within two business days of an online order being placed. The results have been impressive so far. Home Depot's online sales are up 20% through the first six months of the year and account for 6% of sales -- compared to around 3% for peers like Target and Costco. So far the segment has been growing faster than the overall store, which is great news for Home Depot's operations. Last quarter its big-ticket purchases, those that run greater than $900, spiked higher by 8%. That was a big factor in overall growth coming in at 5% -- compared to Lowe's 2% uptick. 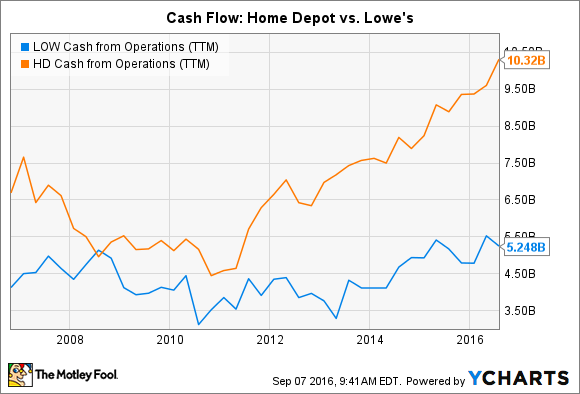 The good news is that surging cash flow means that Home Depot can make these aggressive investments while still delivering higher direct returns to shareholders. Operating cash recently passed a $10 billion annual pace, in fact, about double Lowe's result.